Two years ago Julia Powers’ life changed in an instant. Complaints of pain in her right leg led to a biopsy which revealed this active 8-year-old had osteosarcoma (bone cancer). Fortunately, the cancer was contained within her right tibia and had not had a chance to spread. 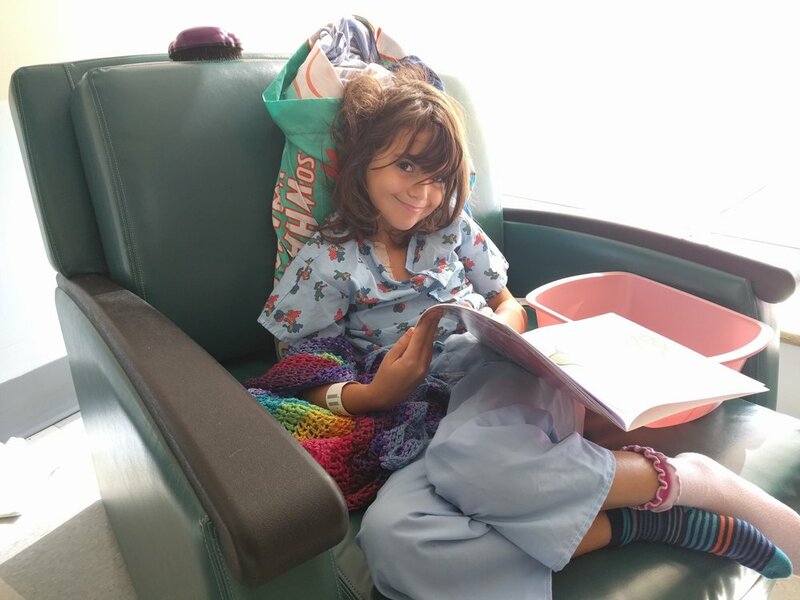 Within a week, a chemo port was placed, and she endured 13 rounds of chemotherapy over 10 weeks, sleeping at Hasbro Children’s Hospital for 4-5 nights at a time to go through a full round of chemo. While the chemo proved to kill the cancerous cells, Julia did not fare well and suffered from infection and neutropenic fever after nearly every round. She lost over 25% of her body weight and had a nasogastric tube for feedings. Once the cancer was believed to be gone, it was time to remove the tumor; but there was still risk of losing her leg. As a lover of horses and a dream to one day be an equestrian, the thought of losing her leg was heartbreaking. Only one of the three options presented by her doctors offered the opportunity for Julia to keep her leg and the promise of one day running and jumping again. In an effort to save her leg, Julia traveled to NYC in November 2016 and went through a grueling 16 hour surgery at Sloan Kettering Hospital to remove the tumor and attach an external fixator to her right leg. Metal pins were placed into her bone through small incisions into the skin and muscle and the pins were attached to an outside bar used to immobilize her leg for proper alignment and healing. Over the course of the next 11 months, Julia faced 13 more surgeries, countless infections (sending her into the ICU) and many trips to NY. Sign up with your email address to be the first to know when Julia’s Room Reveal Video goes live. Julia underwent a bone graft surgery by removing bone from her hips and placing it in her leg with the goal of generating regrowth. Currently she uses a lift on her right foot that aims to even out the imbalance, which will be remade as she grows. In several more years, once she stops growing, she’ll need to undergo yet another surgery to lengthen her right leg through an internal prosthesis that lengthens her leg over time. While initially in a wheelchair, Julia has navigated her mobility issues and now uses a crutch to support her weaker leg. While undergoing chemotherapy and all her surgeries, she missed all of third-grade and much of her fourth-grade year. Despite this set-back, she is an avid reader, along with her brother, Thomas (13) who has been a huge source of support for her. Currently supported with a crutch, she practices walking outside at her home in North Smithfield. Despite being dealt an unfair hand and having to endure so much in her short 10 years of life, Julia has stayed positive and always seems to have a smile on her face. Our hope is that through Savvy Giving by Design, we can create a space that will bring more healing and joy to their entire family.